Martinaire Aviation is a Texas-based air cargo carrier that has been providing delivery services and plane maintenance services for over 30 years. Their fleet consists of 29 Cessna Cargomaster planes servicing over 40 cities throughout the United States, which includes their facility in Lansing, MI that is located next to the Capital Airport. Pat Jemison, Martinaire’s Director of maintenance, top priority for the facility, is the safety of his crew and providing ideal working conditions. Jemison has a maintenance staff that works around the clock six days a week making sure the Aircrafts are in perfect working condition in the field. 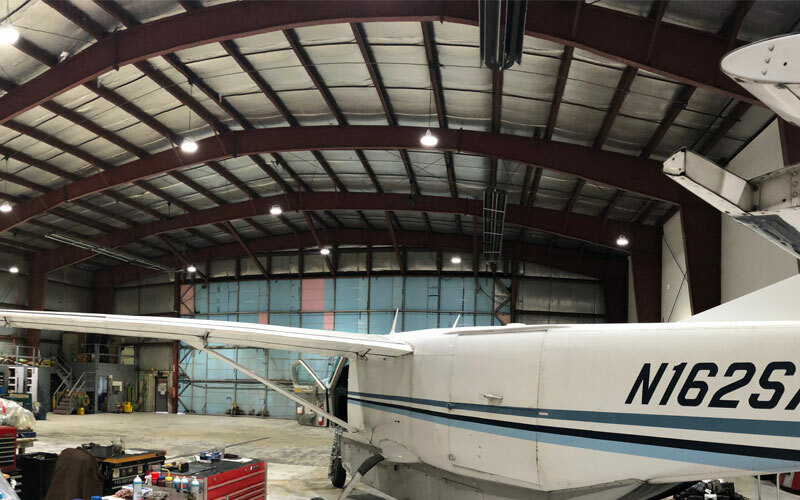 The lighting in their aircraft hangar facility was poor, relying on 25, 400 Watt Sodium vapor lamps to light their entire 30,000 square-foot maintenance hangar. The orange glow from the lighting made inspections and repairs more difficult, also causing eye strain due to the low color rendering index. These old lights also wasted a lot of electricity, running 24 hours a day, six days a week, so Jemison turned to Electro-Matic to offer their expertise on an LED lighting upgrade. After a photometric was done, EM concluded they could replace Martinaire’s 25 fixtures with just 20 ultra-efficient 150W LED fixtures. The aircraft hangar is now 40% brighter and 75% more energy efficient. Plus the 5000K color temperature of the LEDs make doing inspections far easier than before. Electro-Matic did all the paperwork to earn Jemison a rebate from the local utility company to pay for over half the project. He also estimates he is saving around $800 a month electricity costs alone. Between the rebate and monthly savings, Martinaire will see an ROI in under nine months.